Recently, page-level ads were made available for blogspot bloggers and webmasters which means that you can now display AdSense Ads right on your mobile templates. You can now monetize your efforts on the templates as you do with mobile apps thanks to the Google Admob Ads. 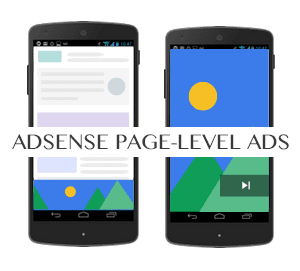 Why Choose AdSense Page-level ads? There are a number of reasons why you choose page-level ads from AdSense to bolster your revenue stream. Today, the two types of page-level ads available include Anchors which are ads places at the bottom of the screen and Vignettes which are full screen ads that work similar to Admob's Interstitial adverts. Vignettes tend to be more effective for mobile advertising. The good news is that you can install these ads from AdSense fairly quickly and easily thanks to the process which guides you through. 3. Click the two toggle buttons to switch on "Anchor/overlay ads" and "Vignette ads"
Note: You will also need to replace the attribute async with async="async" in order to help complete the process, otherwise Blogger will give you an error message. Once you have completed the process, all you need to do is save it to your template. 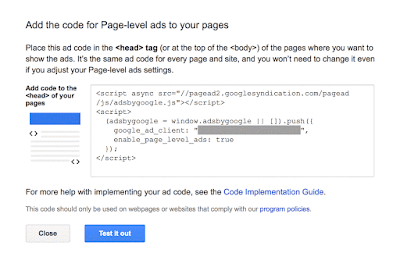 After installation, get out your mobile device so you can test the AdSense page-level ads and see if they are working correctly. You will need to be a visitor to your site in order to check out the ads. You will get to see the ads in action before the public does so that you can tell if they are working fine. If you are impressed with what you see, then it is ready to go. However, if you see something that you want to change or if the ads are not present you’ll need to start over again. Since October, 2015 when these ads were first rolled out the effectiveness that they have demonstrated is considerable. Today, the ads have been used in countries all over the world and they continue to impress. For those who have already used these mobile ads on WordPress or other blogger blogs you can see just how effective they have been in terms of reaching all of your visitors. In addition, the effect on your revenue may be considerable depending on the popularity of your blog. In the end AdSense page-level ads are remarkably effective for mobile use and will help you build a stronger income base for your blog.